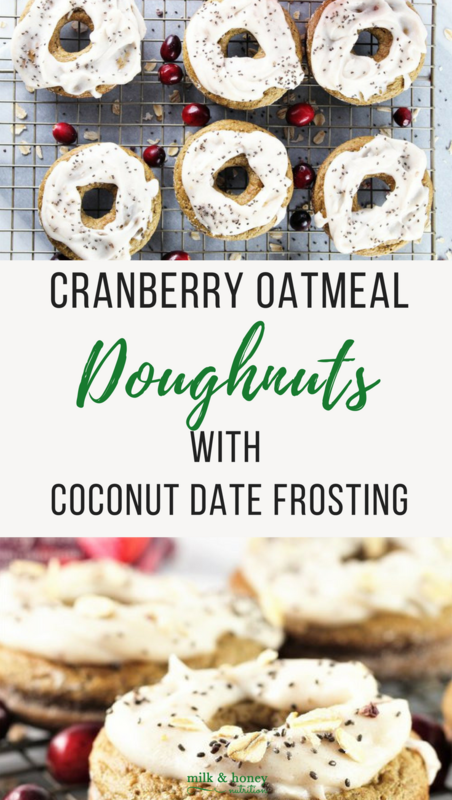 These Cranberry Oatmeal Donuts with Coconut Date Icing are a perfect pick me up to get you going in the morning. They are gluten free, and have almost no added sugar! You can make them as donuts or muffins... the instructions are the same either way! This recipe was sponsored by Modern Oats. All thoughts and ideas are my own. Add the oatmeal, baking powder, baking soda, and coconut sugar to a high powered blender or food processor and blend/process until finely ground. Add the remaining donut ingredients and process/blend until the batter is smooth. You may need to scrape down the sides of your blender or food processor once or twice. Set the batter aside. Preheat your oven to 375 degrees. (350 if using a convection oven.) Rub a donut or muffin pan with avocado oil. Lightly sprinkle a flour of choice (I just use my favorite gluten free flour blend) over the pan and shake/tilt the pan to coat each donut/muffin space with flour. Shake off any excess flour.